Wednesday, September 9 1908 -- The big Ketchel-Papke fight is now in the history books, and writ large is how Papke dominated the proceedings. He knocked the champ, Ketchel, down no less than five times in the very first round. Ketchel never fully regrouped from the bad start, and was knocked cold in the eleventh, but saved by the bell. In the twelfth Papke sent Ketchel to the canvas twice, and the second time Stan K. could not get back to his feet in time for the count of ten. 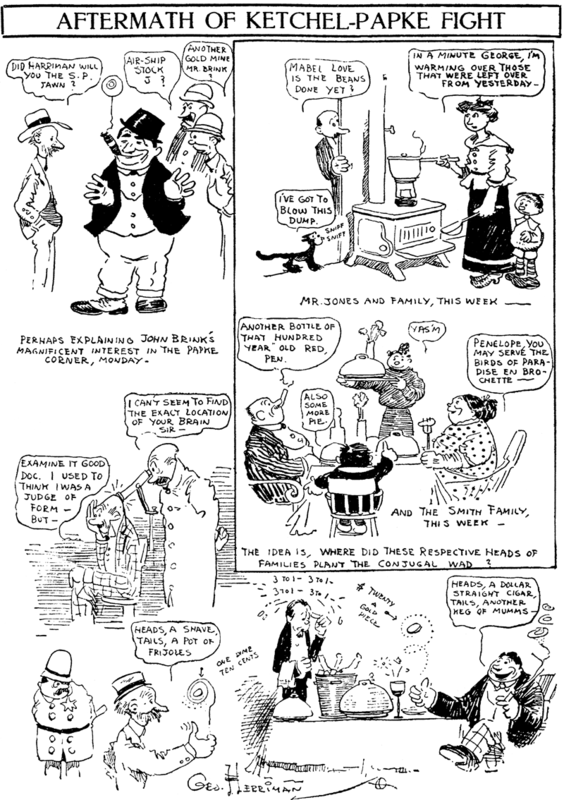 Herriman's cartoon is an exercise in irony, as Papke's odds were only 2-to-1, by no means a road to riches for betting folks. Click for the complete story of the fight, with a Briggs cartoon, from the Chicago Tribune. The Chicago Tribune Archive is great!!! I highly recommended it!! !